One of the most abundant minerals in the human body is magnesium and at least 50% of magnesium is located in your bones. Magnesium is also a crucial cofactor for over 300 biochemical reactions in your body making adequate magnesium levels very important to your health. These biochemical reactions include everyday actions such as the building of muscles, nerve function maintenance, protecting a healthy heartbeat and preserving optimal immune system function. In fact, researchers have currently found 3,751 magnesium-binding sites on human proteins, indicating that the role of magnesium in human health and disease may have been tremendously underestimated. Let’s look at some of the symptoms of magnesium deficiency. The current RDA (Recommended Daily Allowance) for magnesium is 310-320 milligrams (mg) for adult women, and 400-420 mg for adult men. However, the average intake of magnesium among Americans is about 100 mg below these recommended levels making most Americans deficient in adequate magnesium levels. 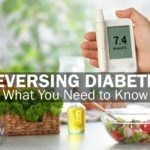 Dr. Carolyn Dean, a medical and naturopathic doctor says that consuming even the RDA amount is only “just enough to ward off outright deficiency.” If you’re deficient, you are likely at a higher risk of type 2 diabetes than normal. It’s also important to remember that for your body to use calcium effectively, you must have adequate magnesium as a cofactor. Unfortunately there are literally millions of people downing calcium supplements without added magnesium and thus experiencing, at best, minimal improvement. A good formula to remember is that the body must have absorbable calcium to make muscles contract and it must have absorbable magnesium to make muscles relax. Calcium and magnesium act together as a pigeon-pair. While we are talking about adequate magnesium levels, it’s important to know that the blood test for magnesium commonly offered in doctors’ offices measures serum magnesium levels. This particular test does not efficiently measure the magnesium level within the cell where 99% of the magnesium in the body is found. Many labs currently offer an “erythrocyte magnesium level” or “red blood cell magnesium level” test. These tests provide much more information about your magnesium levels and are available from labs across the country. Be sure to ask specifically for these tests if you want to know your intra-cellular magnesium levels. Those most likely to suffer from low blood levels of magnesium include senior adults as well as those who consume diuretic medications, which can increase the excretion of magnesium. Magnesium is involved in 700-800 different enzyme systems within our bodies. Magnesium has a “push-pull relationship” with calcium. Calcium causes muscles to contract, while magnesium relaxes muscles. Calcium should never be taken without magnesium. 80% of the population is not getting the recommended daily allowance of magnesium. Low levels of magnesium can lead to recurrent bacterial and fungal infections. There are two reasons for this common micro-nutrient deficiency: (1) The soil doesn’t have magnesium. (2) There is more stress/higher demands of magnesium going on in the body. Medications, diet choices, and water sources can “bump” away, deplete magnesium storages, and bind to magnesium. It takes 28 molecules of magnesium to metabolize one molecule of sucrose (table sugar). It takes 56 molecules of magnesium to metabolize one molecule of fructose. Nutritionally speaking, high fructose corn syrup requires more magnesium and more energy to metabolize. It leads to high triglycerides and fatty liver. As it turns out we were only meant to eat fructose in the form of fruit with all its fiber intact. One of the medical signs of diabetes is low blood levels of magnesium. Adequate magnesium levels can significantly reduce systolic and diastolic blood pressure levels in those with pre-hypertension. People with normal blood pressure do not experience a decrease in levels when taking magnesium. At least one in five Americans most likely have high blood pressure levels. Common electrolyte products do not replenish magnesium. Neither farmers nor organic farmers replenish the soil with minerals. Farmers would need to use rock dust on the soil to do this. The soil is much lower in magnesium currently compared to ancient times due to: (1) overuse of the top soil and (2) the recycled water we use today has not undergone micro-nutrient accumulation. When fluoride (a molecule found throughout our environment) and magnesium bind – a compound of magnesium fluoride called sellaite is created. Sellaite is able to replace the magnesium found in bone and cartilage, overall making bones more prone to fracturing. 20% of prescription drugs have added fluoride molecules to assist in drug delivery to the cell. The highest amount of magnesium is found in the heart. Doctors and specialists often see and treat the various symptoms individually, and may be unable to put it all together as a magnesium deficiency. Magnesium deficiencies have contributed to ending the careers of professional athletes due to severe muscle cramps. The Magnesium Miracle 2014 by Dr. Carolyn Dean. “Magnesium enhances insulin secretion, facilitating sugar metabolism. Without magnesium, insulin is not able to transfer glucose into cells. Glucose and insulin build up in the blood, causing various types of tissue damage.”Experimental and clinical data suggest an association between magnesium deficiency and depression. As early as 1996, a study by Dr. Richard Cox and Dr. Norman Shealy, neuroscientist, noted a correlation between low magnesium and rates of depression, finding 100% of 475 chronically depressed exhibited deficient magnesium in magnesium tolerance testing. A more recent and much larger study published in 2009 in the Australian and New Zealand Journal of Psychiatry confirms these findings. Examining data from 5700 adults in the Hordaland Health Study in Norway, researchers noted a statistically significant relationship between magnesium intake and depression. Participants who reported dietary habits low in magnesium were more likely to test positive for symptoms of depression using the Hospital Anxiety and Depression Scale. 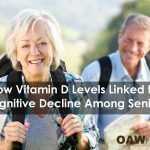 Results remained significant when adjusted for age, gender, blood pressure, and socioeconomic status. In a review of three studies of over 85,000 women and 42,000 men, individuals who consumed adequate magnesium levels lowered their risk of developing diabetes more than 30 percent during the next 12 to 18 years compared to those who consumed the least amount. The studies suggest that adequate magnesium levels influence the action of insulin in the body. And a lack of magnesium may worsen insulin resistance, triggering the onset of diabetes. One 2013 study involving pre-diabetics found that most had inadequate magnesium intake. Those with the highest magnesium intake reduced their risk for blood sugar and metabolic problems by 71 percent! A study, published in the American Journal of Clinical Nutrition, found that daily magnesium supplements activate glucose transport, improve the behavior of hormone regulators, and improve overall oxidative glucose metabolism. In a large Japanese study (the Hisayama Study) published in Diabetic Medicine in 2013, researchers found magnesium intake was a significant protective factor against type 2 diabetes in the general Japanese population, especially among those “with insulin resistance, low-grade inflammation, and a drinking habit. In the Framingham Offspring Cohort (2006), higher magnesium intake improved insulin sensitivity and reduced type 2 diabetes risk. In January 2004, researchers at the Harvard School of Public Health reported a significant correlation between magnesium intake and risk of Type II diabetes. Their report was the result of two large scale, long term studies following over 170,000 health professionals and evaluating diet and its impact on disease: The Nurses’ Health Study and the Health Professionals’ Follow-up Study. A new meta-analysis released in May, 2017 pooled data from 11 studies with results indicating that dietary supplementation with magnesium may reduce levels of inflammatory markers. Researchers from Iran, Australia and Mexico focused on the CRP (C-Reactive Protein) which is an inflammatory marker. Results of this meta-analysis indicated that magnesium supplementation reduces CRP levels among individuals with inflammation. This finding suggests that magnesium supplements may have a beneficial role as an adjuvant for the management of low-grade chronic systemic inflammation. Magnesium supplementation was not found to significantly affect plasma concentrations of CRP. However, when the analysis was focused on those with already elevated CRP levels, a significant reduction of CRP values was observed. The difference between subgroups was statistically significant. 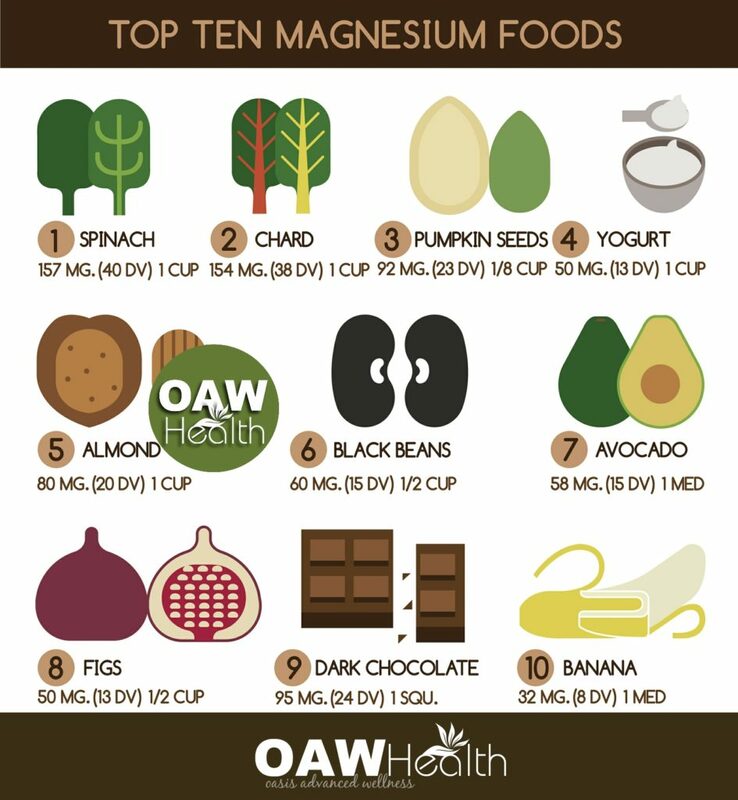 Some of the best food sources of magnesium that can provide adequate magnesium levels are green leafy vegetables, banana, avocado, figs, nuts and seeds, dark chocolate, organic yogurt, goat cheese, salmon, and dried beans. Magnesium’s Importance Far Greater than Previously Imagined. Greenmedinfo.com December 5, 2012.
http://www.ncbi.nlm.nih.gov/pubmed/17645588 J Intern Med. 2007 Aug;262(2):208-14. Wang JL, Shaw NS, Yeh HY, Kao MD. Magnesium status and association with diabetes in the Taiwanese elderly. Asia Pac J Clin Nutr. 2005;14(3):263-9.
http://care.diabetesjournals.org/content/early/2013/09/23/dc13-1397.short ADA Diabetes Care October 2, 2013. Longstreet DA, Heath DL, Vink R. A potential link between magnesium intake and diabetes in Indigenous Australians. Med J Aust. 2005 Aug 15;183(4):219-220.
http://www.ncbi.nlm.nih.gov/pubmed/21868780 Diabetes Care. 2011 Sep;34(9):2116-22. Simsek E, Karabay M, Kocabay K. Assessment of magnesium status in newly diagnosed diabetic children: measurement of erythrocyte magnesium level and magnesium tolerance testing. Turk J Pediatr. 2005 Apr-Jun;47(2):132-7.
http://www.mdpi.com/2072-6643/5/10/3910 Nutrients September 27, 2013.
http://onlinelibrary.wiley.com/doi/10.1111/dme.12250/abstract Diabetic Medicine December 2013.
http://www.ncbi.nlm.nih.gov/pubmed/17229895 J Am Coll Nutr December 2006. Current Pharmaceutical Design. Effect of magnesium supplementation on plasma C-reactive protein concentrations: A systematic review and meta-analysis of randomized controlled trials. 2017 May 25. doi: 10.2174/1381612823666170525153605. Lopez-Ridaura R, Willett WC, Rimm EB, Liu S, Stampfer MJ, Manson JE, Hu FB. Magnesium intake and risk of type 2 diabetes in men and women. 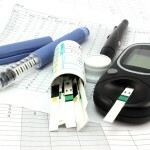 Diabetes Care. 2004;27:134-40. Cox RH, Shealy CN, Cady RK et al. Significant magnesium deficiency in depression, J Neurol Orthop Med Surg 1996; 17:7-9. Jacka F, Overland S, Stewart R, Tell G, Bjelland I, Mykletun A. Association between magnesium intake and depression and anxiety in community-dwelling adults: the Hordaland Health Study. The Australian And New Zealand Journal Of Psychiatry. January 2009;43(1):45-52. Paolisso G, Sgambato S, Gambardella A, Pizza G, Tesauro P, Varricchio M, D’Onofrio F: Daily magnesium supplements improve glucose handling in elderly subjects. American Journal of Clinical Nutrition. 1992;55:1161–1167.